We have been busy here at the South house and it doesn't look like its about to slow down but we don't mind--its been filled with family fun. 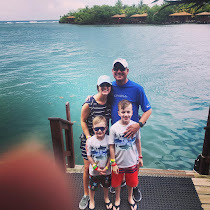 We last left off with a little Daddy Bear update but a few things went down before that I haven't had a chance to blog about so this post will not only cover those outings but most of the outings since Daddy Bear too. One big South dump, photo dump that is. The weather has finally turned here in KC and the weekends have just been amazing. I have never wanted to be outside more than I have over the last few weeks. We kicked off this amazing weather with an impromptu trip to the zoo. We were on a little bit of a time crunch since it was also the Chiefs home opener, Grandparents Day & my Mom and Dad's 34th wedding anniversary but we didn't let that get in the way of having loads of fun while we were there. We got to meet up with some of my girlfriends and their kiddos and the boys just had a blast. Stacy and I always joke about how cute Logan and Lucy would be together and how one day they will make the most gorgeous babies EVER but we are pretty sure they sensed it too. Logan did not want to leave Lucy's side & of course we had to capture it all on camera. Totally going to be used in their wedding video. & for some reason my boys didn't want anything to do with me but luckily Lily was all about being the leader and she and I led the way! The outdoor fun didn't stop there. A few Friday's later we decided that it would be fun to take the kids to their first Drive-In Movie. What I didn't realize is that this would also be Justin's first Drive-In Movie--say what?!?! We had dinner and then drove to the drive-in and once we arrived Jason took the kids to play as the rest of us unloaded the cars and try to guess where everyone would want to sit. So of course the kids pretty much played musical chairs the entire movie & never once sat in the spot where we wanted or thought they would sit. Still had a great time. A few days later we decided to go to the apple orchard as the guys had their fantasy football draft. We decided to head north on K7 and visit the Cidar Hill Family Orchard. We had a great plan of packing a lunch and having a picnic once we arrived and before heading out to pick apples. As we pulled into the driveway the gate was closed & we were 45 minutes early. We Googled a nearby park & headed there for our picnic instead. Once we arrived back at the orchard we grabbed a couple bags, hopped on the wagon & headed out to the apple trees. For the next hour or so the boys ran from tree to tree picking apples as Jennifer and I tried to keep up. We made our way back to the front of the orchard where we were able to get a few apple cider slushes and some kettle corn. Jennifer and I sat down at a table and the boys ran off to play & play & play. Perfect afternoon adventure. & then that evening we got to play a little catch with one of our favorite four-legged friends. This guy could chase Frisbees all day long. A few days later we headed off to Deanna Rose & Grammy got to come with us. We took our time making it around the park--starting off with the chickens and roosters & finishing off with a few trips down the slides. The boys got to ride a pony, they fed the goats & the ducks, & they stopped to make a wish at the waterfall. Its days like these that I wish I could just push pause and soak in every single second. We have also started taking advantage of Kaden's bike riding skills and taking evening rides/walks to the lake. Logan was a little confused when we started talking about riding our bikes at "the Lake", he thought we were loading up the Yukon and heading down to the "Lake" where we would go swimming. It took a little bit of time for me and Kaden to explain that we had our own lake by our house and that we would just be gone for a little while so Stoli wouldn't be sad. & before the week was over we were back at Deanna Rose celebrating Kiley's third birthday. We started the morning off with Logan and I heading to gymnastics while Kaden and Daddy headed to the birthday party. Logan and I arrived a little after the party had started where we jumped right into the activities and then Kaden and Daddy left for Kaden's soccer. Both boys were beyond pooped after our busy morning. I did manage to snap this picture of the boys and for the first time in my life, I finally see a resemblance. They actually look like brothers!! & these are just a few reasons why I LOVE this time of year so very much.